According to Thyro8’s website, this thyroid supplement is the complete thyroid support system that is designed to relive the symptoms of thyroid illnesses – primarily hypothyroidism. Better mood. Higher metabolism. More energy. Fuller hair. Healthier skin. These are exactly the kind of benefits we want to get from a thyroid support supplement! The first is selenium. As many of you probably know already, selenium is essential in converting T4, the inactive hormone, into T3, the active one. Selenium has also been shown to reduce TPO antibodies. The source of selenium, L-selenomethionin, is reassuring as this is the organic form found in plants, including brazil nuts which are commonly associated with high levels of selenium. Iodine is another important mineral. If you’re unsure why, see our article here. The inclusion of Iodine is not surprising, as most thyroid supplements include it – since we all know how important Iodine is to creating T3 and T4 hormones – but regardless, it does still make it difficult for Hashimoto’s patients to be able to take Thyro8. It is often recommended those with Hashimoto’s do not take extra Iodine as it could worsen their symptoms. Vitamin K2 is relatively unknown and has not been thoroughly studied on how it has affected thyroid function. It is still beneficial though, as other studies have pointed to indirect effects through helping other functions in the body. 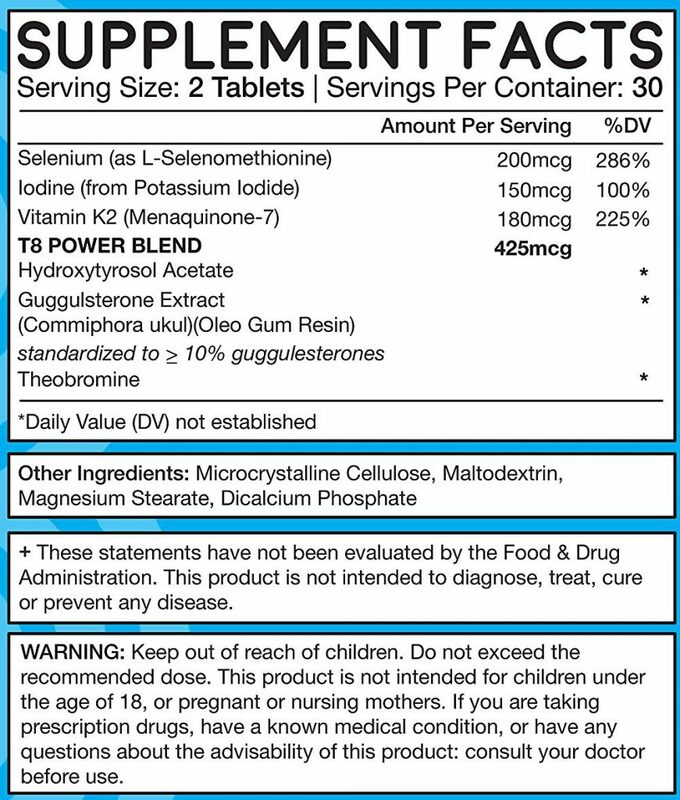 The T8 power blend is Thyro8’s proprietary blend of 3 ingredients as seen in the supplement facts label above. It contains a useful herb such as guggulsterone extract. However, because it is a proprietary blend, we do not know the exact amounts of each ingredient in the blend. It is possible that there is very little of guggulsterone while there is a lot of hydroxytyrosol acetate, which is relatively unstudied on its effects on the thyroid. Thus, it may not be as useful if there are large amounts of hydroxytyrosol acetate and small amounts of guggulsterone, which has had more studies done on its beneficial effects for thyroid function. The obstruction of the proprietary blend in determining the amounts of each ingredient make it difficult for patients to know exactly what is in Thyro8. Apart from this, Thyro8 does seem to be consumer friendly. It has a money back guarantee and contains useful information for thyroid patients on their website. 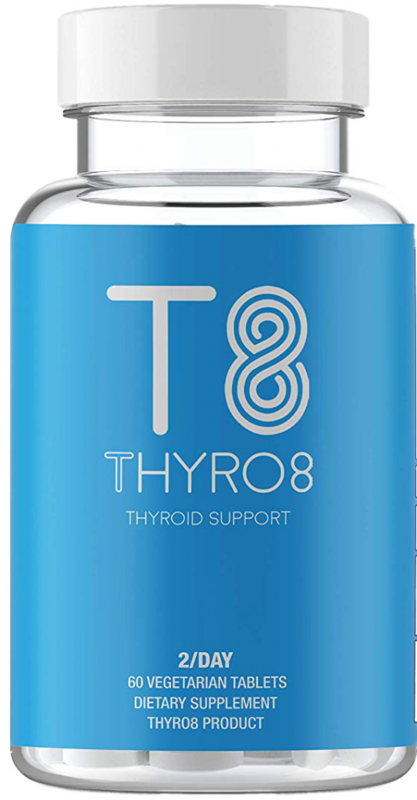 All in all, Thyro8 does contain some good elements to help support your thyroid. Apart from the obstruction of the proprietary formula, we know the exact dosages of each ingredient which is helpful in determining how Thyro8 works. With that being said, it is missing some ingredients to fully support a healthy thyroid. Ashwagandha is definitely one of them, and we even wrote an article about why here. Zinc and Magnesium are two other minerals that have been shown to influence a healthy thyroid. Vitamin B12 is another. The lack of inclusion of these other ingredients do not necessarily make Thyro8 less effective than other thyroid supplements, but it does result in Thyro8 not fully being able to alleviate everyone’s thyroid issues. After all, if a patient has low zinc or magnesium which in turn is causing thyroid issues, Thyro8 certainly not be useful as it would not be able to raise these levels. For those with low Iodine however, Thyro8 will be useful in that case. Some thyroid supplements, like Thyro8, contain specialized ingredients, which work best for people who are specifically deficient in those areas. Research literature (such as this one on Vitamin D for instance) suggests thyroid patients require different vitamins and minerals than what is found in Thyro8. Side effects with most natural supplements are uncommon and rare, and this seems to be the case with Thyro8 as well. Some reviewers have said they felt a bit nauseous or felt like they gained a bit of weight, but that seems to be on the rarer side. The majority of reviewers note that they have not felt any adverse side effects from taking this thyroid supplement. Thyro8 is available for purchase on their website and Amazon. A bottle of Thyro8 starts at $39.95, which is more expensive than what we usually see the price for a thyroid support supplement. They sometimes have 15% discount codes floating around though, which can make the price a bit lighter. Thyro8 also has an option for to subscribe and save, where you are signed up for an auto ship program. Every month, or how many you choose, Thyro8 will automatically charge your card and ship you the supplement. You save 20% with this method, which is definitely better and more convenient for some. On the other hand, if you do not like the supplement and don’t believe it has benefits for you, you’ll have to manually cancel the auto-ship program for Thyro8 before you get billed again. Would this product be helpful if thyroid has been remove do to cancer? Those with thyroid that have been removed will not benefit as much from thyroid supplements as those with healthy thyroids. I am on a tiny dose of Levothyroxine .005 daily after taking oral iodine that burned out my thyroid. I was wondering if this pill will change the medications effectiveness. You have to take Levothyroxine on an empty stomach and an hour before food or coffee. Hi there, I’ve just ordered 3 bottles. Is it recommended to take these supplements long term?